How many times have you been asked if you use butter or margarine? Inevitably your answer will lead to a sometimes heated discussion as the person posing the question will have strong opinions. Both have their passionate admirers and equally their detractors and there are those that have simply opted for olive oil and others think that using neither is the answer. Back Chat will give you both sides of the argument. You decide which you prefer. If you are still undecided, do contact me at les@leslieback.co.za or leave a comment on Back Chat. I would be delighted to help you make up your mind or answer any question you may still have. BUTTER is a culinary treasure and the delight of all those who relish delicious food. The superiority of the flavour of butter over margarine is constantly debated. Ask a French Chef and he or she will think you are mad. "Le Beurre, le beurre naturellement!" Essentially, pure butter is produced today as it was in the time of the Pharaohs, except the butter is made from the milk of cows rather than of camels or water buffaloes. It takes just under 10 kilograms of wholesome cow’s milk to make 500 grams of butter. MARGARINE is a product that was conceived by a French chemist in the 1860’s to meet the pressing need for a longer lasting and more economical alternative to butter to suit a growing population that had moved from the countryside into the cities. Noting the pearly sheen, he named his invention margarine, taken from the Greek word “Margaritas” meaning pearl and also the root of the name Margaret. So we have our French Pearl. 2% other ingredients such as food colouring, preservatives, sweetening agents, salt etc. The melting point of margarine can be formulated to range between 91-109F (33-43C). Many of the higher point margarines are used in the baking industry. There would seem to be a similarity between butter and margarine in fact the two are totally different. Farm made butter uses the cream directly from whole milk, whereas commercially made butter is made by extracting small amounts of cream from whey, a by-product of cheese making using large centrifuges. These are devices for effecting separation, usually of one liquid from another or of a solid form of liquid by rapid rotation. Margarine manufacture is carried out in two distinct stages. The first stage is called refinement where oil is extracted from seed or beans and refined. The second stage is called processing where oil and other materials are made into margarine. 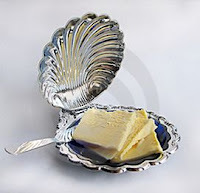 Cultured Butter: An unsalted butter which a harmless bacterial culture is added to the cream before churning. It has a delicate tangy taste that some refer to as having old country flavour. Flavoured Butter: Herbs and/or spices have been added during the process, e.g. garlic butter. Whipped Butter: Air has been beaten into the butter so it is softer, has more volume and spreads more easily. It should not be used in recipes calling for plain butter. Ghee: A type of clarified butter originated in Eastern cultures. Available in speciality stores. Clarified Butter: This is butter, from which the water content has been evaporated, leaving a clear yellow fat which can be heated to a high temperature without burning. This is ideal for frying or other cooking. When ordinary butter is used, it should be heated gently and slowly to avoid burning. Light Butter : This is a new product that contains 25% less fat than traditional butter. It is excellent as a spread but not recommended for cooking or in sauces or recipes that require a large amount of fat. Butter is one of the most highly concentrated forms of fluid milk containing protein, calcium and phosphorus (about 12%) and fat-soluble vitamins A D & E.
When margarine first appeared on the market it looked and tasted like lard. The gurus rethought the process and using sophisticated techniques developed a product that smelled and tasted like butter. Butter producers, believe it or not, went back to the drawing board and today most butter contains colour additives to compete with the yellowness of margarine. While margarine is often advertised as being derived from polyunsaturated oils, what you should know is that the oil is changed to margarine by a method called hydrogenation – saturating with hydrogen. 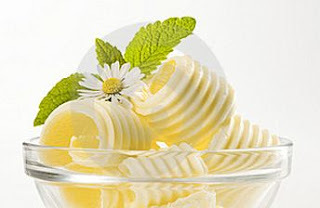 Some margarines do contain small amounts of liquid polyunsaturated oil added to a hydrogenated base, but the bulk of the fat must of necessity be saturated. Otherwise margarine would be liquid like any polyunsaturated oil. Once a vegetable fat is hydrogenated, a new fat has been created. Margarine is a perfect example of a fabricated food, the earliest non-dairy substitute. There has been vast research into the production of margarines. Here are some explanations of terms that may help you when we discuss cholesterol. It is very important to understand that there are 2 kinds of cholesterol. Fats and oils are mixtures of fatty acids. Each fat or oil is designated ‘saturated’ ‘monounsaturated’ or ‘polyunsaturated’ depending on which oil predominates. SATURATED FATTY ACIDS have all the hydrogen the carbon atoms can hold. Saturated fats are usually solid at room temperature. They don’t combine easily with oxygen and turn rancid. Saturated fatty acid raises cholesterol, which in turn raises the risk of coronary heart diseases and strokes. MONOUNSATURATED FATTY ACIDS are liquid at room temperature. They have only one unsaturated bond. Salad dressing containing olive oil turns cloudy when refrigerated but is clear at room temperature. MFA seem to lower total cholesterol when substituted for saturated fat. A fatty acid molecule is connected to hydrogen. People eat them in the form of meat and dairy products. HOW DOES HYDROGENATION CREATE TRANS FATTY ACIDS? To help foods stay fresh on the shelf or to get a solid fat such as margarine, food manufacturers hydrogenate polyunsaturated oils. Hydrogenate means to add Hydrogen. HOW ARE TRANS FATTY ACIDS HARMFUL? In clinical studies, trans fatty acids or hydrogenated acids tend to raise total blood cholesterol levels and LDL (bad cholesterol) and lower HDL (good cholesterol). BUTTER The problem with butter is that it contains two cholesterol raising agents, dietary cholesterol and saturated fat. Dietary cholesterol is found only in animal products. There is none in plant-based food. Different people have different cholesterol tolerances. A doctor should be consulted and relevant tests undergone to determine personal cholesterol levels and the amount of future intake. It is important to know that cholesterol is needed to maintain intestinal health and is also needed for brain and nervous system development of the young. Human breast milk is extremely high in saturated fat and cholesterol. Cholesterol aside, butter’s biggest trouble is its saturated fat content. These are solid at room temperature and are found largely in red meat and ‘high dairy ‘products. In excess it raises the LDL. A healthy moderate range of saturated fats is 10-15 grams. 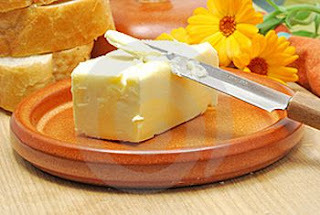 BUTTER is a rich source of easily absorbed vitamin A. It also contains all the other fat-soluble vitamins E, K and D. It is rich in trace minerals especially selenium, a powerful antioxidant. It supplies iodine and vitamin A needed by the thyroid gland. Butter has appreciable amounts of BUTYRIC ACID used by the colon as an energy source. It is also a known anti-carcinogen. MARGARINE is by no means void of artery clogging fat. This may come as a big surprise to some. Here the controversy lies with its levels of trans fat – largely a man made fat. These are formed when hydrogen is added to vegetable oil making it more solid and less likely to spoil. What is more, trans fats may make our blood platelets stickier. A blood platelet is a minute, colourless disc shaped corpuscle. Large numbers are found in the blood of mammals and aid coagulation. The more solid the margarine is at room temperature, the more trans fat it contains. As a rule, the softer the margarine product, the fewer trans fatty acids it contains. The anti margarine lobby attack the way it is made. All margarines are made from assorted vegetable oils that have been heated to extremely high temperatures. This causes the oils to become rancid. After that a nickel catalyst is added, along with hydrogen atoms to solidify it. Nickel is a toxic heavy metal. Finally deodorants and colouring are added to remove the margarine's smell (from the rancid oils) and greyness. TIME OUT Some help with decoding the terms used for margarine. Emulsion: A mixture of oil and water. Emulsifier: Something that keeps the oil and water together. Without it, the oil and water would separate, with the oil floating on top of the water. Triglyceride: Is the form of white fat that occurs in nature. Triglysceride comes from food and is also made in the human body. Hydrogenation: Occurs through the addition of hydrogen to unsaturated fats to create saturated fats, which have a higher melting point. Fractionation: Liquid oil is cooled under controlled conditions. Temperatures are different and the fat is separated into two parts, one which is more solid that the other at room temperature. The traffic in butter increased. It was no longer merely the province of the farmer’s wife. Dairies and creameries were created to deal with the new demand. Firkins are small wooden vessels or casks used for the storage of butter. These originally owed their popularity to the fact that they permitted the storage of butter without refrigeration. Sometimes these left the taste of wood. These were replaced by cans, which were greatly favoured by the navy. Eventually, large white 60 pound tubs made from the wood of white Ash were introduced in the West of America. In the East, the wood of the Spruce was favoured. The controversy lasted years giving way in 1917 to the use of three galvanized steel hoops for the tubs and a galvanized steel rim for the tub covers was added. Many changes were made all over the world. Australia used square boxes. These were also made in different shapes and sizes and eventually were in moderate use. Defects had to be overcome with this method. Paraffin paper was used, then vegetable parchment. After many changes and experiments vegetable parchment heralded the beginning of the almost indispensable use it now enjoys as a wrapper for butter. Due to its greaseproof character, insolubility high wet strength and its odourless and tasteless properties, it was versatile and suitable as a wrapper for other fatty foods. MARGARINE Margarine as we know it today is packaged in containers to resemble those that contain butter. They are usually labelled with details of their fat content. Julia Child, steadfastly clung to certain ideas. She tolerated the microwave oven, but, try and cut corners with butter and she would have none of it. ‘If you’re afraid of butter as many people are nowadays’ she said in one of her last television shows, ‘ Just put in cream!’ She proclaimed with a twinkle in her eye. She died at 92. Good genes or good luck.